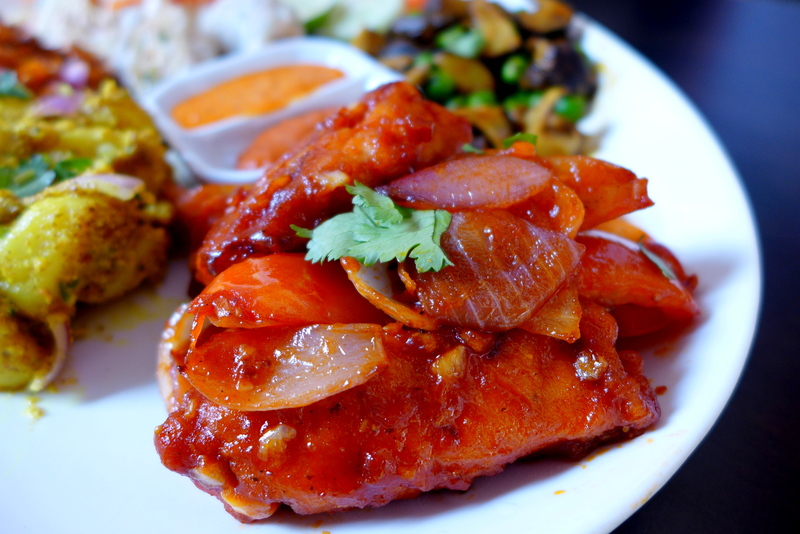 The food and beverage industry in Klang Valley can be fickle at times, but Restaurant Nepal at Plaza Damas is a strong contender for a more permanent future with its excellent service and delicious food. Owner Robin Sherchan hails from Nepal and took a risk opening this restaurant, but within just a few months of operation it has received positive reviews and many returning customers. 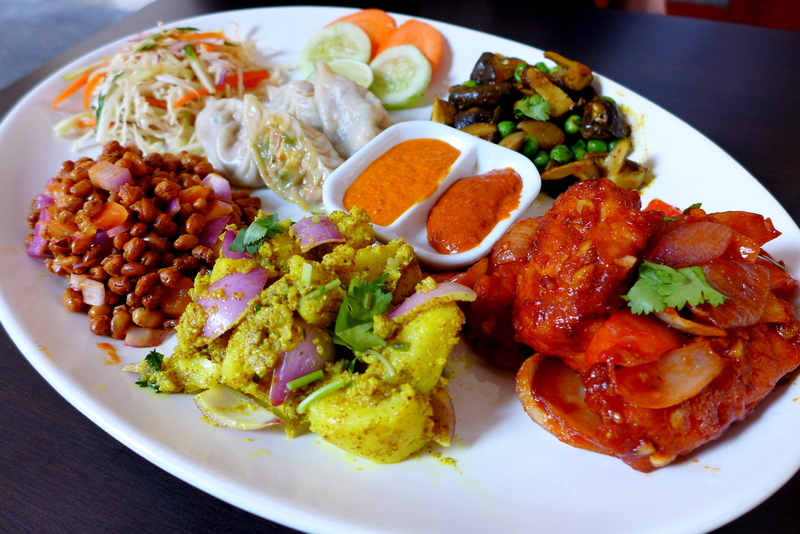 Nepalese cuisine is largely a variation of Indian cuisine with strong Chinese and Tibetan influence. 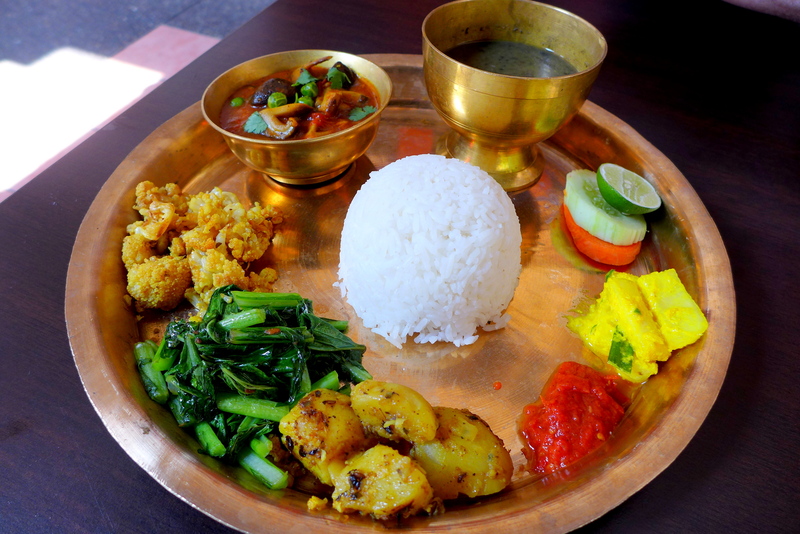 Restaurant Nepal specialises in Thakali cuisine specifically; which uses plenty of spices, wide range of vegetables, and grains like rice, dal and buckwheat. Yak and buffalo are commonly consumed in Thakkhola too, although geographically that would be rather difficult for Malaysia. There are two chefs running the kitchen at Restaurant Nepal, Robin’s sister Amrita Bhattachan who’s a vegan, and another who focuses on the meat dishes. So the strict vegetarians and vegans can be reassured that there won’t be cross-contamination of meat products in your dishes. The menu has a good balance of meat-based and plant-based dishes. Everything is made in-house with recipes passed down from their mother and many ingredients are brought in from Nepal, ensuring a truly authentic dining experience. 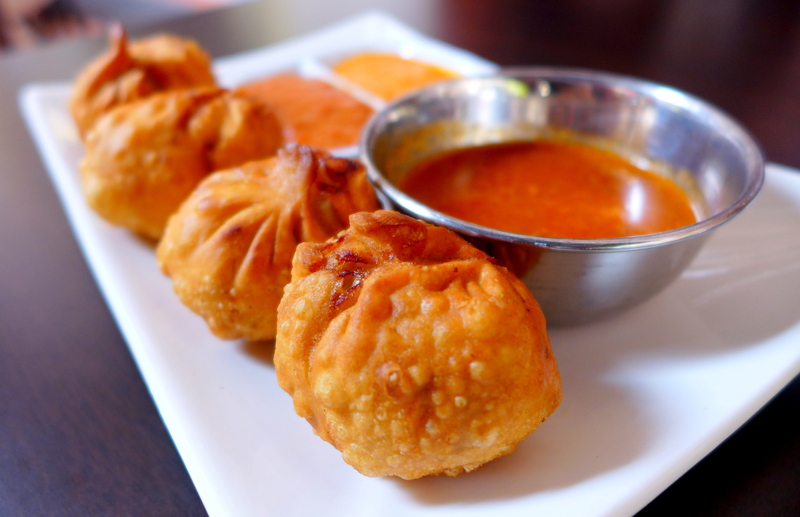 Momo, the Nepalese take on dumplings, is the most popular dish here. They look very much like Chinese’s Xiao Long Bao and are filled with either Chicken or Vegetables. The deep fried version is served with few types of sauces including a delicious curry gravy (RM7 for 4pcs). If you are a chili addict, be sure to ask for the extra fiery chili sauce made with Dalle Khursani, which translates to “Fiery” in Nepalese. The momos are absolutely moreish with perfect crispy skin and juicy filling of ground chicken and aromatic coriander. The Snack Platter (RM24) is perfect for sharing, comprising smaller portions of their best dishes: Steamed Momo, Chicken Chili, Aloo Silam, Bhuteko Bhatmas, Nepali Salad and Chyau Mutter. Feel free to opt for vegetarian momos for some variation, as they are equally delicious. The Chicken Chili tastes similar to Chinese Sweet and Sour Chicken, but with a bit of spicy kick. 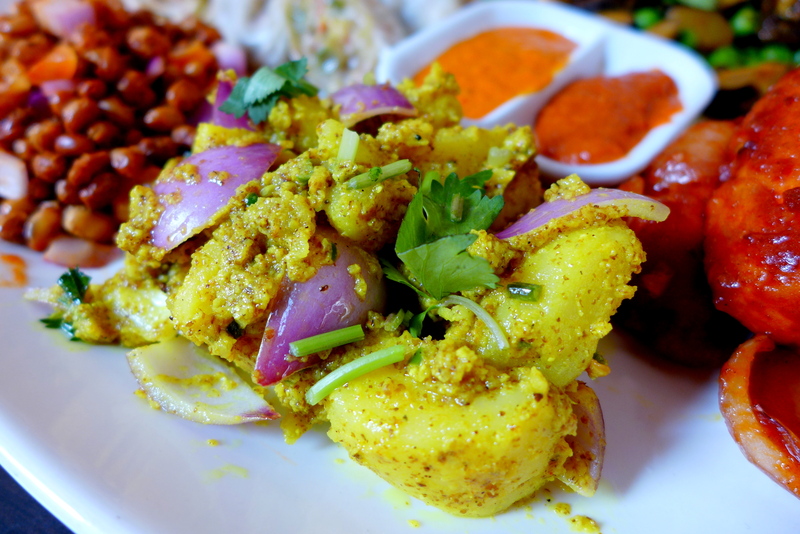 Aloo Silam is boiled potatoes marinated with red onion and Perilla Seeds, which lends a nutty aroma to the potatoes. 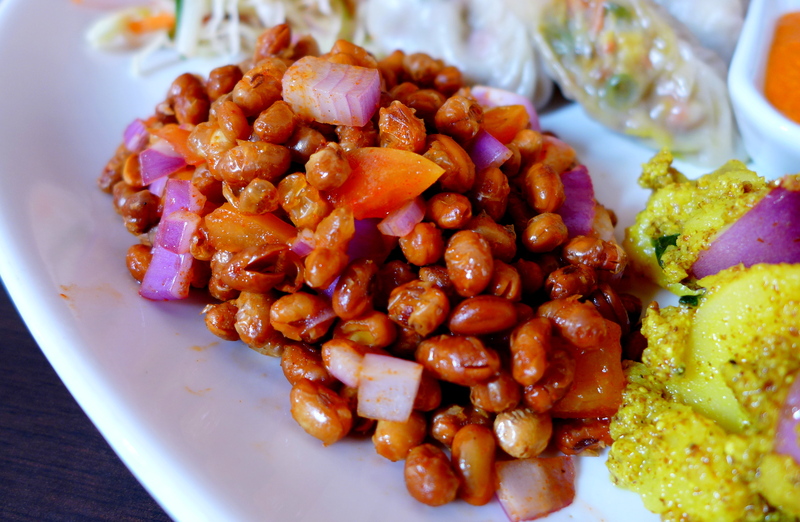 Bhuteko Bhatmas are roasted soybeans spiced up with Nepalese spices, onions, tomatoes and coriander. Crunchy and zesty, these would be perfect with a pint of beer. To make up the fibre intake, the Nepali Salad is refreshing with shreds of cabbage and carrots, and the Chyau Mutter is earthy with simple stir fried mushrooms and peas with cumin. It’s a platter of gorgeous colours and play on texture. 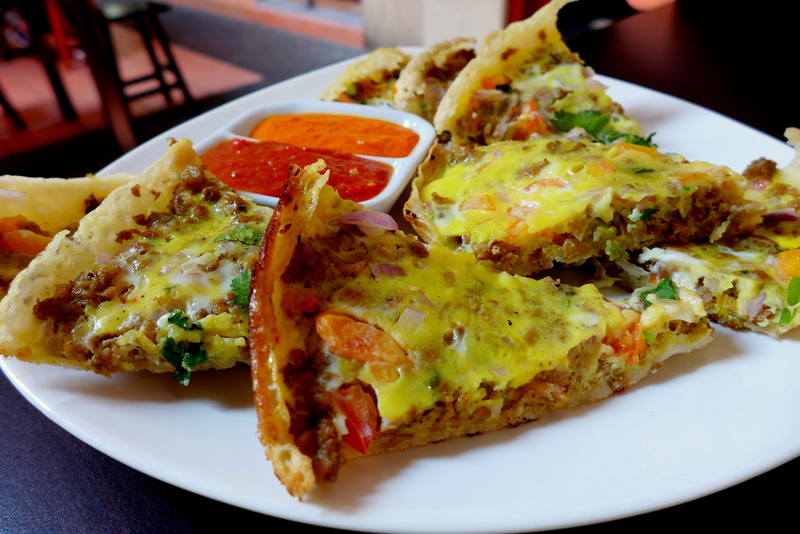 Another interesting dish is Chata-Mari (RM12), a thin rice crepe topped with minced chicken, chopped tomatoes, onions, coriander and egg; it’s also referred to as Nepalese Pizza. The crispy base is superb with the fluffy eggy toppings, tastes like a cross between Pizza and Quiche or Frittata; adding the chili sauce takes this to another level. Single Diners may opt for one of their Thakali Thali Set, with choices of Chicken, Lamb, Fish and Vegetarian Curry as the main star and various vegetable side dishes. We opted for the Saag Sabji Ra Bhat set with comes with a tangy and mildly spiced Mushroom and Pea curry. The black dal is the most intruiging, made with green bean pounded by hand for hours. 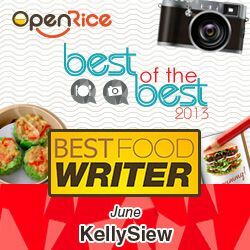 It has a creamy texture and delicate flavour, goes really well with rice. Of all the side dishes, the tomato puree is rather surprising as it is spiked with Timmur, a Nepalese pepper not unlike Szechuan Pepper with its unique aroma. Make sure you leave some stomach space for the dessert too. The Sudip: Sliced bananas and a dusting of paprika on cinnamon-infused yoghurt is tart, silky and extra soothing if you had a few fiery dishes. 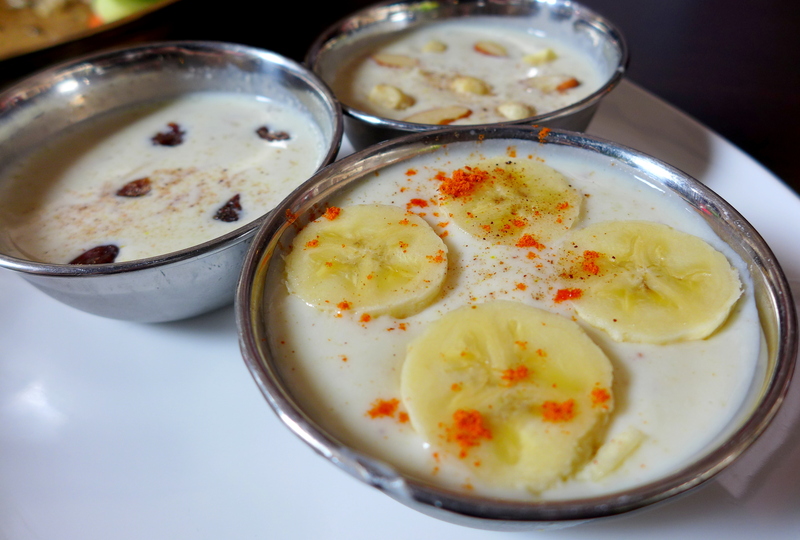 Other options include a rice pudding with dusting of slivered almonds, and a vermicelli pudding cooked in coconut cream, both are delicious. Dining at Restaurant Nepal is not only a gastronomical experience, Robin makes for a great host and is always up for a chat about Nepalese culture and its cuisine, and thumbs up for the service staff for explaining each dish in detail to us first comers. Moreover, the prices here are reasonable too. This is a place worth revisiting multiple times. This review was published on The Malay Mail’s Weekly Runner today.